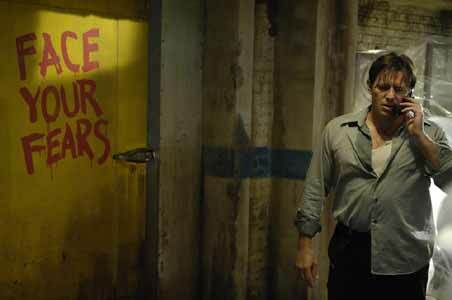 Sci-Fi Online: The level of secrecy on the Saw follow-ups has been amazing. I knew the press didn't get to see it but I understand that the cast don't even know how it ends yet? 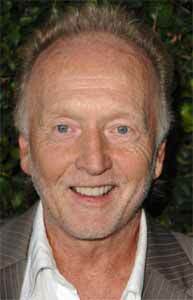 Tobin Bell: That's a continuing theme with the Saw people. They've told me: "Don't tell them anything!" SFO: Is there anything you can tell us without giving too much away? TB: You get to know a little more about John Kramer and what his background is, where he comes from. That's a pretty interesting aspect of the story. And I think some of the traps and tricks are amazing. And I think that the ending will live up to expectations. One of the hallmarks of the Saw movies has been the unexpected twists and I think Saw IV has one that will make your jaw drop. SFO: There's been a constant backlash against violent films, the 'gore-nography' as they're calling it. TB: Gore-nography? I haven't heard that one. SFO: No? Well, what does it feel like to be an arch gore-nographer?! good. How could it not be good? It's a new word and I'm one of the first. Let's just say then that it's groundbreaking...! SFO: The reaction against the Saw movies is strange. They are violent but there's a deep, dark moral purpose to it. TB: Yes. That's part of the reason, I think, why they're so successful. There's a balance between a certain delicate intelligence that functions as a counterpoint to the intense murder and mayhem that's going on. That's the great thing. It's like good music. It's lovely to have a certain theme, that's powerful but if you can offset that with something pastoral, like the great symphonies. 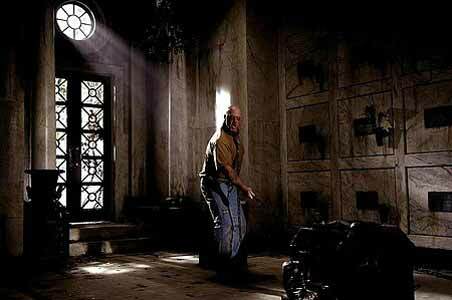 So rather than have something that has only one dimension, the Saw movies have some intricacy to the texture. SFO: They're certainly smarter than many give them credit for. TB: When you say "they're" a lot smarter, I take the "they're" to mean the people. Darren Bousman who directed Saw II, III and IV, James Wan and Lee Whanell, who created the whole idea, and then I have to talk about the costume designer, the director of photography, the editor who have all been with us since the first film. They are certainly a lot smarter than they've been given credit for. It's a collaborative thing, which is unusual for a film. Most of the film - and television - that I've experienced is hierarchical, it operates from the top down and you do what's on the page. That's not how the Saw films are put together. They're put together with someone like Darren looking to his department heads and actors for their thoughts and then it's up to him, as the captain of the ship, to say: "Hmm, interesting, I hadn't thought of that". It's a great creative environment and I think the films have benefited from that. It's very unusual. For film and television, time is money, but sometimes it takes time to work these things out. I'll give you an example. Ten days before we started shooting Saw II, Donnie Wahlberg and I started working on the dialogue with Darren. It took us ten days to get it where we wanted it for those six scenes we had together. We whittled it, we honed it. Donnie would call up me up at midnight and say: "I thought we had it but we don't. I just realised this doesn't make sense". So we'd talk some more, or find ourselves down in the bar with Darren again. I have to know what I'm going to say: if there's one thing that John Kramer doesn't do, he doesn't hem and haw. He knows what he's going to say, he's right on it. It's a constantly evolving process that's served us and continues to serve us. SFO: Did you have any idea on the set of Saw that it would become an annual event? TB: No. Not at all. We had no idea. I did it because I thought it was dramatic and theatrical. I liked the surprise, I did not anticipate the last moment at all. I thought if they shot that well, it would just be a remarkable moment. And they did and it was. 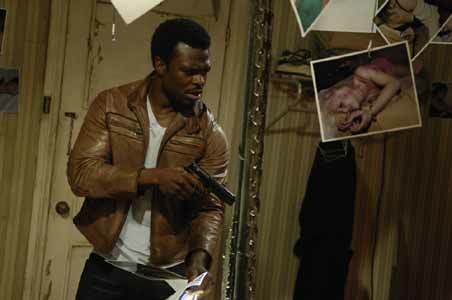 And it gave me a chance to work with Danny Glover who I've always admired. That's why I did it. I wasn't thinking that it was something that might turn into a sequel. SFO: John / Jigsaw must be a fun part to play. TB: It is a fun part to play. He's grand. He's extremely committed to what he does, he's multifaceted, he's a reader and a scientist and an engineer. He's interested in the world and in politics. It's as good a part as you might want to play. SFO: You've appeared in Seinfeld, Alias, The X-Files, Murder One, Charmed, ER, 24, NYPD Blue, The West Wing, Stargate... You only need a voice part on The Simpsons and you'll have every great show of the last 20 years covered.
? It doesn't get any better than that. It's a good day at the office. And if the scene goes well, it's an even better day at the office. You get home, sit down and think "wow". In Mississippi Burning, my first scene was in a cobbler's shop. I walked in with Gene Hackman and had two or three lines - and good lines. But it doesn't matter how many lines you have, the lines relate to the story. It's not about the words, it's about how it plays out, how it fits, how it contributes to the story. That's what's rewarding. And I was crammed into this little cobbler's shop, with Alan Parker, Gene Hackman and Pruitt Taylor Vince played the cobbler... Essentially, it's those little moments that you remember. Not the big stuff, not the commercial stuff. I remember sitting around outside just talking with Frances McDormand who wasn't a big name then. Actors are like everyone else, we just do our job. It's just that our job sometimes sees up on this 60ft screen. It might seem like it's very glamorous but it's not really. SFO: After playing Jigsaw / John, do you find the public looks at you differently now? TB: One of the funny things is that people come up and say: "Hey, you're... you're..." and I think they're going to say: "The Saw guy" and they'll say: "You were Bleecker Bob in Seinfeld". I was on a field trip with my son, a science field trip, and we were in a cafeteria and these 14-year old girls were walking towards us and my son said: "Oh, here we go..." and they got to the table and said: "Hey, you're the guy from Charmed". I'd been in one episode as this blind guy with long hair but they were huge Charmed fans. Right now though, we're in the 'Saw Zone', so my visibility is quite high and that's a nice thing. I still have some privacy but I can also get a decent table! 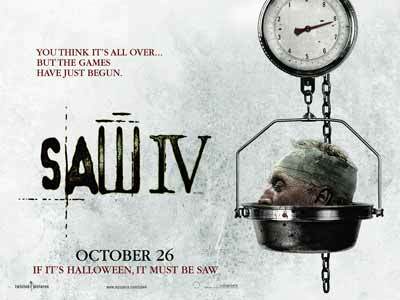 Saw IV is released in UK cinemas through Lionsgate Films from 26 October 2007.